Tile floors are beloved for their easy to clean nature, especially in areas which attract a lot of dirt or moisture, such as entryways and bathrooms. Tile floor cleaning is a great way of keeping these important areas looking like new, and also preventing any dirt from spreading into other areas of the home. So this is intended as a general guide for how to make all those beliefs about tile floors come true, for specific areas of the house. For these areas, the homeowner is usually confronted by little more than crumbs, dirt, and maybe a layer of dust. Day to day tile floor cleaning can be done with nothing more challenging than a broom and a dust pan. Simply sweep up any loose dirt on a regular basis, perhaps a few times a week, and throw it away. Make sure to get into the gaps and spaces because grout cleaning is also very important for keeping it looking like new. Both tiles and grout can absorb a lot of dirt and discolor. Every so often, you will need to wet clean the flooring by using water and a mop and rubbing at the floor to scratch away the more stubborn dirt and mud stains. In the bathroom, you can use many of the same methods as for any tile cleaning but because of the higher humidity and moisture content, you may want to add some bleach or other cleaning agent to the water. This will kill any mold growth which can happen in bathrooms. How often should I clean the tiles? The frequency can really depend. Regular sweeping should occur a few times per week to keep dirt from accumulating in the tile and being spread into the carpet. The more deep cleans should be done at least once a month. 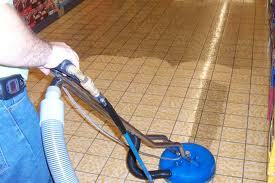 This can prevent the stains from discoloring the floor permanently, and will let the tiles last longer. Also, the need may change depending on the weather. Muddy conditions on the outside will quickly trickle into the home, and during the winter, sand and salt are often sprayed on the roads to prevent ice from spreading. Those will also be tracked inside and need to be cleaned up. Commercial buildings love tile floors because they are more durable than carpet, especially when there are lots of customers coming through and walking every day. Tile can be cleaned quickly overnight, when fewer people are around, and with very little water to keep it safe to walk on.